Tómas is a violinist of wide-ranging interests, whose performances of standard repertoire as well as twentieth century and contemporary works have gained him recognition not only in his native Czech Republic, but also in the UK where he lived for 20 years in the many European countries where he has performed (Switzerland, France, Italy, Holland, Austria, Slovenia, Germany, Poland) and as far afield as Israel, appearing in festivals and recording for radio and television. Born in Prague into a family with several generations of professional musicians, he made his debut at the age of ten in concerts and television appearances in Poland, Germany, as well as his native Czech Republic. After a spell with the BBC Scottish Symphony Orchestra 1985-89 he settled in London, where he established himself as both performer and teacher. In April 1996, at the invitation of the Franz Schubert Society, he performed in Prague and throughout the Czech Republic, with additional concerts in Vienna and Slovenia, in a series of Schubertiaden He is also keen to promote lesser-known areas of the violin repertoire. Thus, in 1993 he gave the first performances in London and Prague (for Czech radio) since the war of Jaromir Weinberger’s Colloque Sentimentale, a piece which received enthusiastic critical acclaim in Berlin and Dresden in the 1920s. In the past year programmes have included rarely heard works by Jan Krtitel Vanhal (1739-1813) and Jan Hugo Vorisek (1791-1825). He has recorded an album of twentieth century and contemporary pieces by Gorecki, Colin Matthews, Ernest Bloch, J B Foerster, and Petr Pokorny. He recorded Antonin Tucapsky’s The Seven Sorrows with the Bath Camerata at St George’s, Brandon Hill, Bristol, which has been issued as a CD on the SOMM label. He performed with the New Chamber Orchestra, Oxford (appearing alongside Ivo van der Werff, viola, in the Medici Quartet), the Oxford Sinfonietta, and various orchestras in the Czech Republic. In 1999 Tómas toured Belgium giving much acclaimed concerts with works of Vieuxtemps. 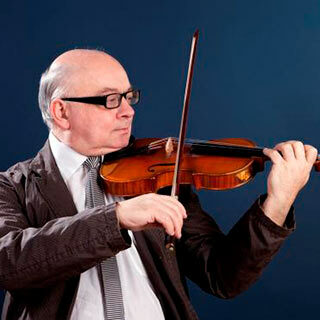 1997-2002 Professor of violin, viola and Chamber Music at Blackheath Conservatoire (London). From 2006 Tomas has been working as professor of violin and chamber Music in Slovenia Czech Republic and more recently in Slovakia and started a new project Ensemble Moscheles specializing in performing music by romantic Jewish composers ( B.Godard, H.Wieniawski, H.W.Ernst,L.Auer, B.Dessau ) as well as contemporary composers from Israel ( A.Adler, Y.Leef, E.Avitsur, S.Cohen , H.Ben Kennaz,B.Levenberg,U.Brenner ). As a member of Ensemble Moscheles Tomas is going to perform in Warsaw, Prague, zagreb, Budapest, Ljubljana, Krakow and other cities.